Arsenal boss Unai Emery gave his players the weekend off as they prepared for Thursday’s Europa League clash against BATE Borisov. Mesut Ozil ended up traveling to Turkey with his fiance Amine Gulse and was joined by teammate Saed Kolasinac. You would have thought he was the only player to leave England, in fact, you may have been led to believe there was a crisis going by the way in which some media outlets reported the story. The Daily Star led with the headline Why has Unai Emery reject Mesut Ozil gone to Turkey? followed by ‘Mesut Ozil has escaped the UK amid speculation over his Arsenal future and a feud with boss Unai Emery’. 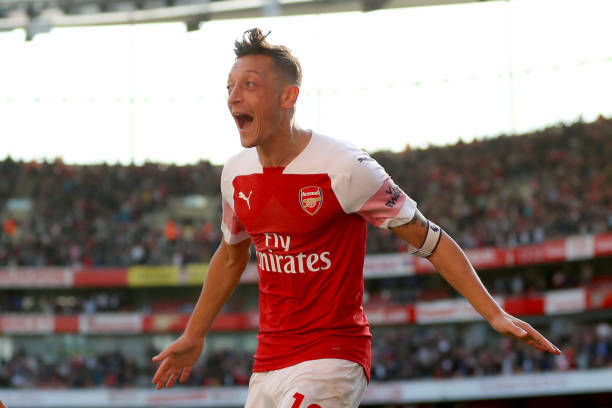 The Mirror had the following headling, ‘Mesut Ozil leaves UK to clear his head amid Unai Emery problems at Arsenal’. The Sun newspaper meanwhile wrote, ‘Mesut Ozil leaves UK amid standoff with Arsenal boss Unai Emery to take stunning fiancé Amine Gulse to Turkey’. None of the three pieces mentioned that several other Arsenal players also traveled abroad over the weekend. Pierre-Emerick Aubameayang went to Italy with his brother, Mohamed Elneny went on a pilgrimage to Mecca, Alex Iwobi visited to France while Aaron Ramsey traveled to Italy. And here is Elneny in Mecca. While Iwobi went sightseeing in Paris.